It’s been two months since we left but I feel I really need to tell you the ins and outs of the life we experienced on the MRQ because every day I get traffic on my website from someone ‘googling’ the Murray River Queen or Harvest Hopper Review and I feel I’m providing those people with advice but not real hard facts of fruit picking. 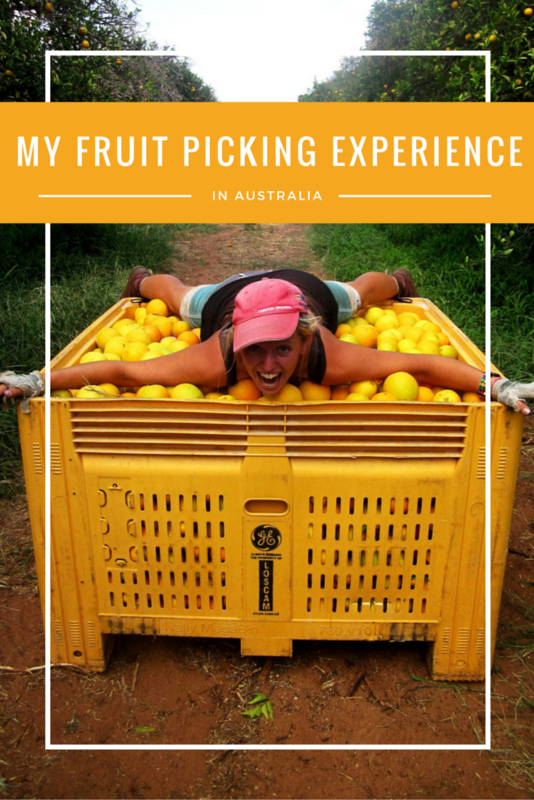 Second Day of Fruit Picking – that day I was man handled on to the tractor by our boss and 3 of us were driven across one farm to another with no idea what was going on because we didn’t understand her English! When we headed off to the MRQ we were promised plenty of work and the ability to pick 4 bins each a day with in two weeks, we were promised a pleasant environment perfect for couples, all in all we were promised something every different to what we arrived to. Being picked up from the bus station to find out they had, had the biggest party on the boat last night. A room had been trashed, no one has gotten any sleep, the noise level was insane and because of all this the on board bar was now closed. This was not what we were expecting, a good social atmosphere perfect for couples was what was described to us not a huge party with two thirds of the boats residents being single guys. Still there was nothing we could do about it, and as we soon learnt that wasn’t the only thing promised that we didn’t get. There are several people that are employed by this company simply to get people on board at their working hostels. They are basically sales people and will tell you what you want to hear just to score more residents on board. For the first two or three weeks we kept our heads down – we did the orange picking, we had a laugh with the other new people who arrived the same week as us but the rest of the time we chilled in our room and stayed away from the madness of the rest of the boat. More than anything we didn’t have the money to keep buying alcohol but mostly it wasn’t what we were expecting and we didn’t really feel like embracing it then. Living on the Murray River really was beautiful – I don’t think there was a day we got up after sunrise when we were working. The work was tough, your hands were constantly getting full of splinters, legs and arms scratched to pieces – I fell off the ladder within two weeks of working and bruised my shoulder for the next week. The heat of the summer only made the job tougher and some days we just couldn’t stay out past midday because the temperatures were unbearable! Our down time was spent being tired and grumpy at each other because we were constantly together – 24/7 contact is going to be tough on any couple and it certainly took its toll on us the whole three months. After three or four weeks we started to join in some of the drinking nights instead of fighting the madness and noise outside of our door. We got to know some of the other people on the boat and that’s when the experience started to become a lot better. We began to have friends, people we could hang out with but there were also some characters that made you feel very uncomfortable. By Christmas we had accepted the way the social side of the boat was and with more new people than old it was easier to make friends and socialise. The work was still gruelling with the bus leaving as early as 5am some mornings it certainly became a gruelling task to wake up so early. Still with a week off over Christmas we were able to relax, sunbath and enjoy the holiday period. As I have already blogged about how we made the absolute most of Christmas and New Year on the MRQ. Everyone pulled together and really made it feel special. By the time the holidays were over we realised that we had done half of our time for the visa and suddenly it didn’t seem so daunting anymore! We had a week without any work which would have been disastrous for money however due to my relationship with our crazy Cambodian boss we were given hourly paid work cutting vines that were growing in the middle of the orange trees. The hourly payment was a welcome bonus compared to by the bin however the work was far more gruelling as you had to stay as long as she wanted you! And trust me that was all day long – she might have been 64 years old but she sure was the hardest worker I have ever met! Us on our final day with our Cambodian Boss – who by the end despite all her craziness said she would miss us! During our time fruit picking we had several run ins with the management of the boat first because they brought too many people on to the boat and didn’t have enough work for them so they took work away from us and decided to break us in to teams which would work three days a week – that lasted all of three days as our boss through a fit and threatened to cancel her contract with the boat. Then at least three or so times a month we had rumours that our papers would not stand up to immigration if signed by our boss – this came down to the last day of work where she told us if immigration phoned her she would deny us working for her. You can imagine on our 89th day that isn’t what we want to hear!! Still we had paid Harvest Hooper’s to help sort these issues out so we assumed they would do that – but it took us practically begging to get them to sort our problems out! Not only were there issues on the work front but during some drunken nights rules were broken – more than once for some people and it seemed that it all depended on who you were to if you were kicked off of the boat for rule breaking or not! The day the air con broke and we decided to take the party in to the fridge! Life on the Murray River Queen had its huge ups and downs but I feel like we were the guinea pigs of the business – it was barely 4 months old when we arrived and there were plenty of lessons they needed to learn about how to run the business – we of course were the ones who got dragged through all of those lessons. I feel that there business is only going to grow and will be a decent place to do your farm work in time to come. It isn’t a good place to go over summer as they have limited work and it is tough however in the winter it is a very different story – we have heard. Overall we have memories and friends from the experience that will last a life time. It has given us some stories which are mental but completely true and most important it is our ticket to our second year in Australia. I think jumping off the top of a four storey boat is right up there in the mental experiences I had during those drunken night on the MRQ. Don’t go here expecting to come away with a ton of money because truth be told it won’t happen. Don’t go here if you don’t like to drink and party every weekend because that is exactly what happens. If you want fun and if you have some money then this place would probably suit you. If that doesn’t sound like you then I would suggest finding a different farm. The farm work may be tough but with a good bunch of people around you it is possible to overcome – just remember it isn’t ‘real life’ and you are doing it for the chance to stay in Australia for a second year. My MRQ experience was nothing like I imagined before we set off but having come out the other side I wouldn’t trade it in for the world. Wow, it certainly sounds like you have taken a tough option to be able to extend your visa in Australia! Fruit picking is tough at the best of times, but I am happy that you have completedyour goal. I hope you enjoy the rest of your time in Australia. Hey, did you hear about any farms that people said were okay? I’m planning on going to Coffs Harbour and feeling a bit nervous about all the horror stories…not sure I’ve read even one positive account of fruit picking!! Do you know anything about what it’s like around Coffs? I just saw an ad for this place on Gumtree and they have the photo of you laying on your bin of oranges! I was like… I’ve seen this before!!! Thank you so much for the heads up Holly, they definitely do not have permission!